The story thus far: Dante, a poet and town prior in Florence, finds himself on a dark road of the soul. Before his spirit can fall to its ruin, he encounters Virgil, the greatest poet of classical Rome. Virgil, at the behest of Beatrice, a woman who was Dante's inspiration in life, offers Dante a journey through the realms of the afterworld, through which Dante may find his soul's salvation. He shall travel through Hell, Purgatory, and Heaven, with Virgil as his guide through the first two. Dante accepts Virgil's offer, and they embark. After passing through the gates of Hell, they encounter the souls of the cowards who took no stand in conflicts between good and evil--Heaven doesn't want them, and Hell refuses to accept them into its realm proper. Dante and Virgil then meet Charon, who rows the souls of the damned across the river Acheron into Hell proper to be judged. 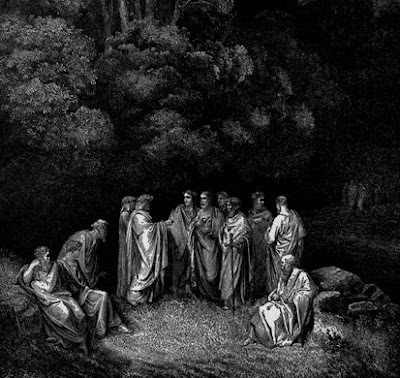 Charon obliquely informs Dante that he is not, nor will he be, among the damned, and Dante passes out before he and Virgil are taken across the river. Moving around my rested eyes. In order to know the place wherein I was. Which gathers the thunder of infinite woe. It was dark and deep and murky. I could not discern anything there. Began the poet, pale all over. Said, “How can I come if you are afraid? Pity; you take it for fear. The first circle bordering the abyss. Made the eternal air tremble. Of children and women and men. Who these spirits you see are. Which is the door to the faith in which you believe. Of these am I myself. To live on, without hope, in yearning." Were, I knew, suspended in that Limbo. Crowned in the emblem of victory. And many others, and made them blesséd. We passed by the forest nevertheless. That forest, I tell you, was thick with spirits. That people of honor occupied that place. Gaining grace in Heaven, which grants them favor. Then the voice abated and was quiet. Their demeanor neither sad nor joyful. Who comes before the other three as if their sire. The other coming is the satirist Horace. Ovid is the third, and the final one Lucan. Who stands above the others like an eagle soaring. So that I was sixth among such genius. Speaking of things about which silence is golden. Such were words in that place where I was. Defended by a lovely stream around it. This we crossed as if it were solid ground. Arriving in a meadow of blossoming green. With great authority in their demeanor. They spoke sparingly, with gentle voices. In order to see their entire number. Those whom I feel myself exalted in seeing. I saw Electra with many companions. And Cæsar, armored, with the eyes of a gyrfalcon. Who was sitting with his daughter Lavinia. Lucretia, Julia, Marcia, and Cornelia. And, alone and apart, I saw the Saladin. All look to him; all do him honor. Who were in front of the others and nearest to him. I cannot describe it all in full. That, many times, words fall short of facts. The company of six dwindles into two. Out from the quiet and into the air that trembles. And I come to a place where there is no light.